As technicians we have many tools to help us manage risk in the stock market. One of the more valuable studies that we perform regularly is the seasonality of the market. During certain times of the year, the market tends to behave in certain ways, while other times of the year are often much different. Today I want to take a look at the dog days of summer and how US Stocks behave during July and August. Also note that the average return for July over those 20 years is 0.0%. 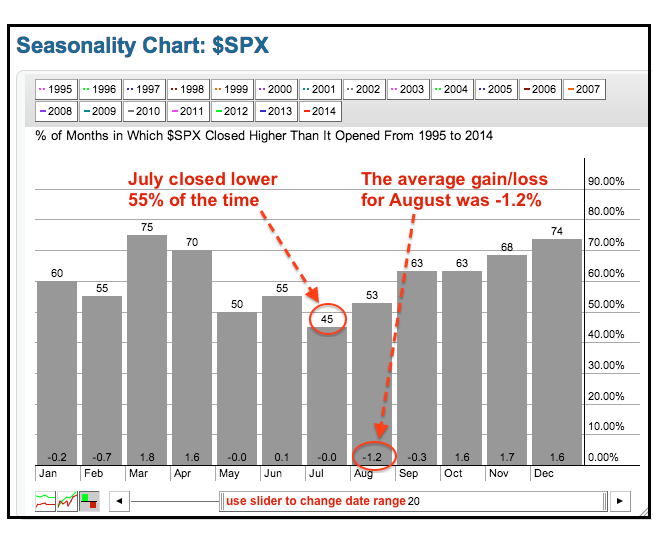 To make matters worse, the month of August has actually averaged a negative return since 1995. So although the month of August is positive slightly more often than it is negative, the losses over the past 20 years have far outweighed the gains. Like our other technical tools, seasonality should be used in conjunction with the rest of our analysis. Plus at the end of the day, price is the only thing that pays. So everything else we look at is strictly supplemental to price behavior. But based strictly on these seasonal tendencies, the S&P500 is likely in for some sort of correction between now and Labor Day, whether it be through time or through price. Volatility spikes tend to coincide with stock market corrections. So based on these seasonal studies, I would expect more volatility and little upside in the major stock market indices over the next 6-7 weeks. We’ll see. Here is the chart I posted Monday about why it makes perfect sense for the stock market to correct from up here. This time, from a pure price perspective. REGISTER HERE for more information on how to access updates on these charts with annotations and commentary on a weekly basis. This week I was down at the New York Stock Exchange for the third annual Thought Leadership Forum. I had the chance to chat with Jessica Menton from IB Times about what we’re seeing in the market, specifically the flight towards larger capitalization stocks. To me this is one of several signs that we are in the latter stages of this bull run for US Stocks. The relative strength in Energy has continued as Financials and Consumer Cyclicals continue to underperform. Is the bottom in for volatility? I have no idea. No one does. But I will say a there is a favorable risk/reward here from the long side to start the week. Why is it so good? Well, we have a defined level where we’ll know if we’re wrong. If we take out Monday’s lows, all bets are off. If you can stomach it, you can also use Friday’s low as the mental stop. It’s an easy entry point. Here the potential failed breakdown last week and quick recovery back above the early 2013 lows. It’s when things like this occur that I get excited. The possibilities if correct are tremendous. But more importantly, if we’re wrong – who cares? The risk is very well defined. Also, between what I’m hearing from traditional media and the amount of bearish superlatives about volatility, I’m pretty sure we’re close to an important low. But the best part is we’ll know if we’re right very soon and the risk/reward is very much skewed in favor of volatility buyers. There are a lot of ways to take advantage of this: ETFs, Options, Equities, etc. The execution really depends on your time horizon and risk parameters. I just like the price behavior, so I wanted to point out what I’m seeing. REGISTER HERE for more information on how to access these volatility chart on a weekly basis. We had a great week and I couldn’t be happier. We went to cash Friday morning in order to digest everything that just happened globally. We’ll take this weekend to reevaluate our bigger picture stance and I plan on having some pretty intense charting sessions over the next few days. I think today’s video is a nice combination of technical observations, as well as some of my opinions on frequently talked about names, Apple included. Can We Really See a Short Squeeze in VIX? The volatility index isn’t something that I mess around with very often. In fact, even during 2008 when the negative correlations between VIX and stocks were near perfect, buying volaitlity still wasn’t my trade of choice. I was much more likely then to just short Financials. Today, I still don’t ever buy VIX as a hedge or as a directional play. But there’s something interesting going on that I think is worth mentioning. First of all, traders that have bought a derivative or an ETF on the VIX have mostly been losing money for years. We all know this, it isn’t a secret. The $VXX ETF itself has been nicknamed the widow-maker by some of the circles around new york city. So there’s that kid touching a hot stove sort of mentality, “It’s burned me one too many times”. This anger is a nice backdrop for a potential long position. So why am I bringing up something that I rarely ever talk about? Well, the last time that investors had this many short positions in VIX futures was just before the volatility index rallied 34% on Feb 25th. This was the biggest rally the index had seen since the summer sell-offs of 2011. Last month, short positions initiated by hedge funds reached all-time highs according to CFTC data. Looking at this chart, I don’t really see much of a reason to get really long volaitlity here. It’s just not the way I would position the portfolio. But I think it’s important to recognize the possibility here based on the one-sided exposure in the marketplace. What are the implications? That’s what I’m mostly concerned with. I know a lot of you guys follow and trade the VIX much more than I do. So if some of you would like to weigh in down in the comment section, I would be curious to read what you have to say. Feel free to discuss. 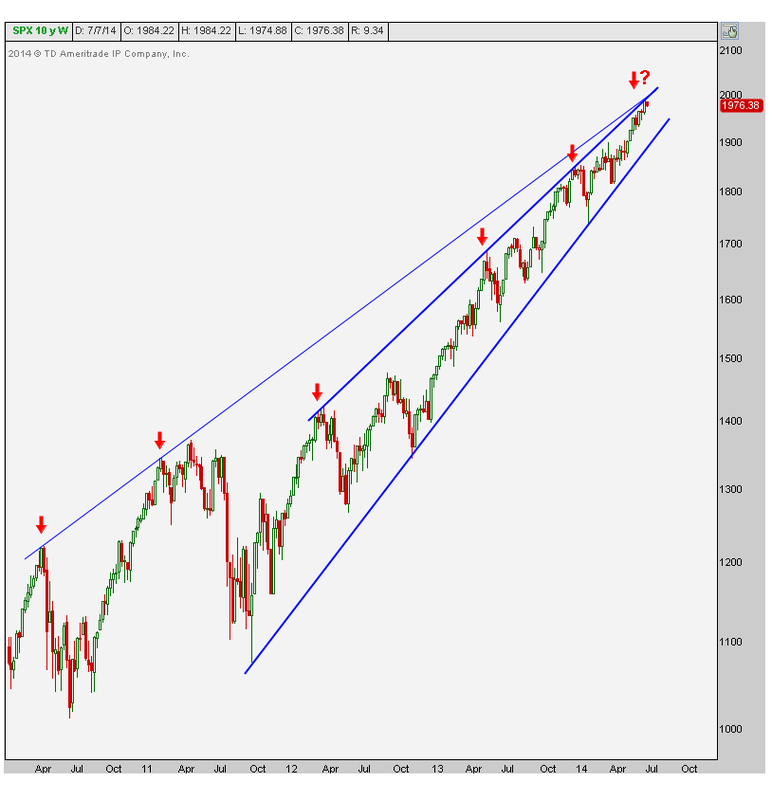 Should We Expect Higher Volatility? To some, higher volatility is a good thing. To others, it’s terrible. And to the rest, it’s just something we need to deal with and be able adjust for. 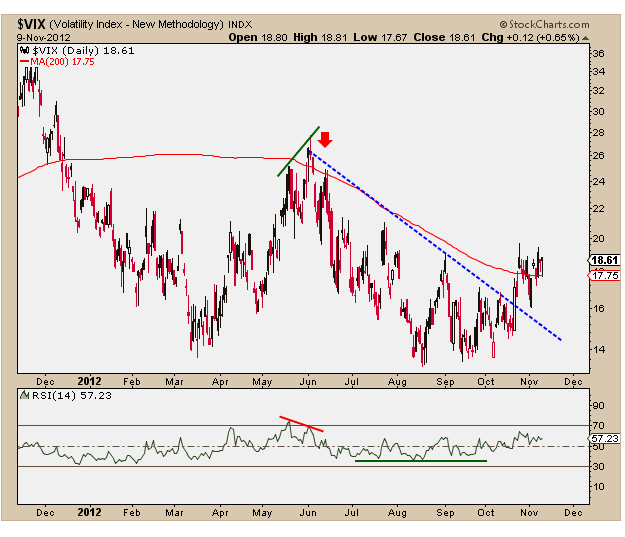 To me, it appears as though the Volatility Index is stabilizing above a (now) flattening 200-day moving average. And this healthy consolidation comes after an almost 5-month downtrend was broken to the upside late last month. Take a look at the Relative Strength Index. 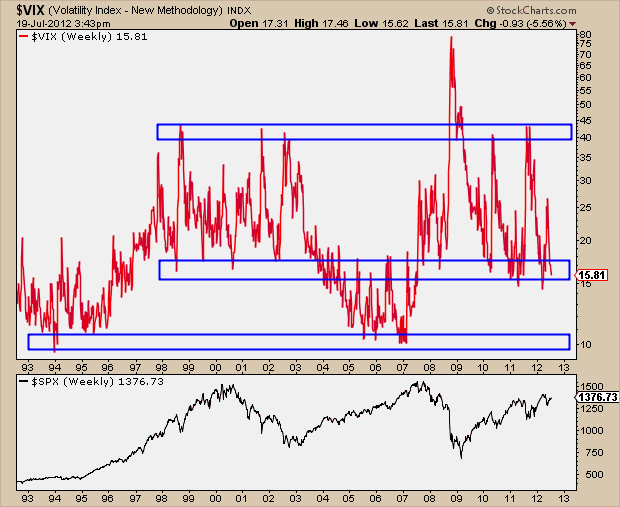 What stands out to me is the fact that the $VIX never got into oversold territory. Support in the RSI consistently came in well above the 30 reading, which tells me that the bulls are still in control and we need to be aware that further upside is likely. The level that we’re watching closely is where the rally got going on Friday. If the $VIX rolls over here back below 17.75, then perhaps we may be able to point to lower prices coming. But I think based on what we’re seeing from RSI and the nice consolidation after the initial downtrend break in price, we have to be bullish $VIX here, at least for now. Tell Me Again, Why Can’t the VIX Go Lower From Here? When stocks do well these days, you can count on the bears to come out all excited about a low Volatility Index. 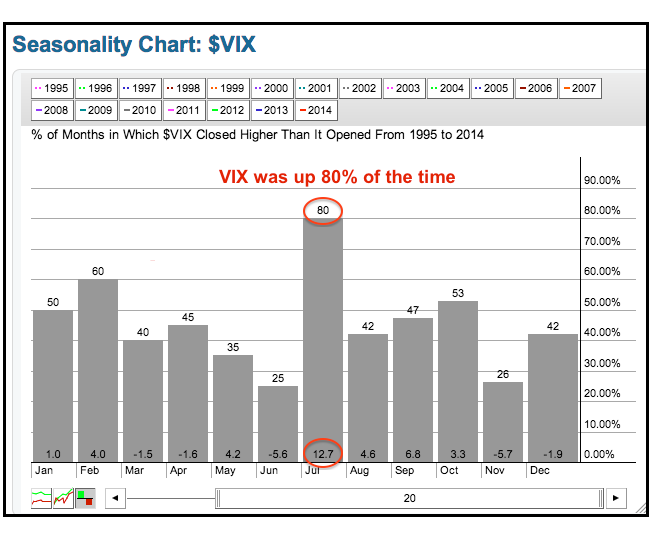 “A $VIX of 15 has been a stock market sell signal for years”, is basically what you’ll hear. But what they won’t tell you is for how many years? What the bears really mean, is that since late 2007 (which marked the end of the cyclical bull market) a low volatility environment has been an opportunity to take risk off the table. Understood. But what about before that? I mean, there was a stock market before 2007 right? Yup, and as it turns out, prior to late ’07, a volatility index in the mid to high teens was actually a buying opportunity for stocks, not a sell signal. 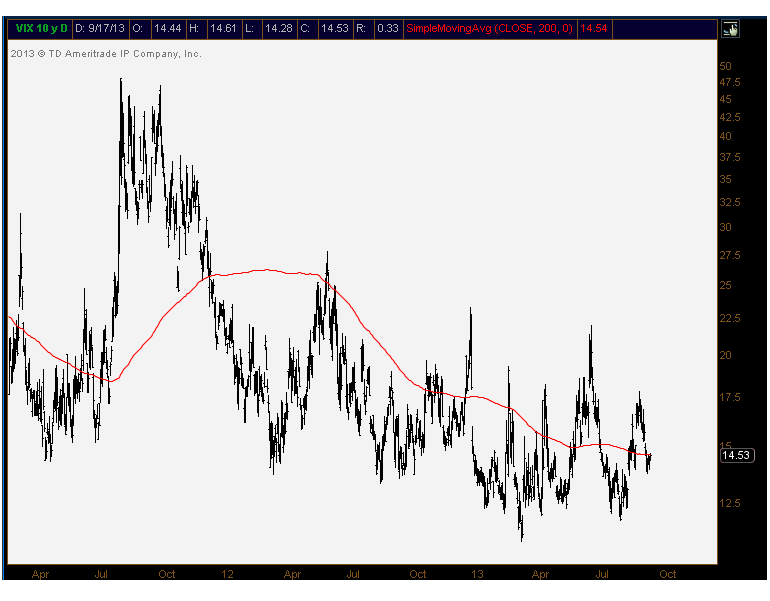 A low volatility index had a 10 handle back in those days. We’re talking, of course, about the period between 2003-2007, which represents the last cyclical bull market we saw prior to the ’08 crash. So what about before that? Well from the late 90s and into 2002, today’s bears would have some nice talking points. Just like the last few years, a Volatility Index in the mid-teens was a chance to take risk off. But before that, low volatility, once again, meant a 10 handle in the $VIX. So I’m not saying that the $VIX won’t go higher from here. All I am asking is why can’t it go lower?